Kleefeld on Comics: On History: Gorilla Suit Day Origins? 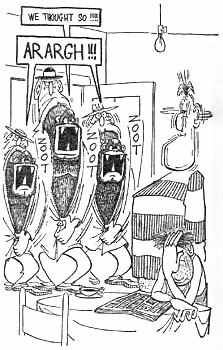 In 1963, Don Martin published National Gorilla Suit Day in a collection Don Martin Bounces Back, in which Fester Bestertester mocks the (then fictitious) concept of a National Gorilla Suit Day, and suffers a series of incredible assaults from gorillas and other creatures in gorilla and other suits. Subsequently, Don Martin fans have celebrated National Gorilla Suit Day on January 31. The story, of course, is brilliant in the way every Martin comic is. I daresay that anyone who's read it finds it brilliant. (Unless, of course, they have no sense of humor. In which case, they don't really count anyway.) I mean, Martin takes a one-note gag, and makes it funny for 56 pages! There's only one room shown for the entire comic and it's always from exactly the same angle, and it's still funny. It's the same joke over and over and over, and it's still funny and fresh and different every time. That is comedy genius at work! So everyone acknowledges that National Gorilla Suit Day was created in honor of Martin and that particular strip. That's cool. But I'm wondering how it got started? I mean, who was the first person to read that strip from 1963 and say, "That's hilarious! I'm going to do that for real"? And why January 31 -- it's not Martin's birthday or anything significant as far as I can tell. Stuff like that doesn't just happen. I mean, Talk Like a Pirate Day is pretty silly as far as holidays go; it's the same type of thing in that regard, but there's a definite origin there. We know the guys who came up with it, and we know it got wide traction thanks to humorist/columnist Dave Barry. But when/where/how did National Gorilla Suit Day become an actual for-real thing? I'm fairly certain Martin never took the idea beyond his comic. So who took Martin's idea and made it a thing? It couldn't really be a conspiracy between the Acme Gorilla-Suit Company and the Ajax Gorilla-Suit Company, could it? I'm a huge fan of National Gorilla Suit Day. Sometime in the 60's Mad magazine put out a calendar that listed NGSD as being at the end of January. I was thinking it was Jan 30, a good friend's birthday, but I guess is was Jan 31. On the 1979 MAD Don Martin calendar, March 5th is noted as NGSD. Does the MAD calendar published inside the magazine in the early 60s say otherwise? Three years late, sorry. My copy of the 1979 MAD Don Martin Calendar shows National Gorilla Suit Day as March 5th.